Urban Sketchers Seattle: Bauhaus Coffee and Dog Park on Pine St.
Bauhaus Coffee and Dog Park on Pine St.
Friday afternoon I took my son and our dog Bijou to the dog park on Pine St. and saw these great urns. Just down the block was a wonderful coffee house with a lot of character Bauhaus Coffee. Labels: Bauhaus Coffee, Capitol Hill, Gail Wong, Pine St.
what rich, warm life you draw out of the downtown scene! Love these. RICH is exactly the right word. These are wonderful, Gail. 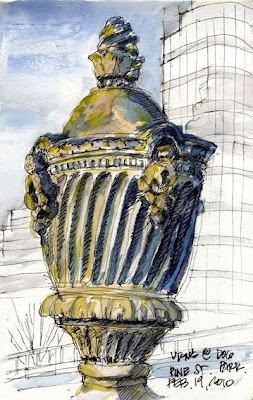 i see those urns every time i walk up to the Utrecht art store at pike, i always think they look so out of place, but the way you sketch that one it looks beautiful, i'm going to have a new appreciation for the them next time i walk by! Nice work. I've never seen the urns, something to look for on my next trip to town.